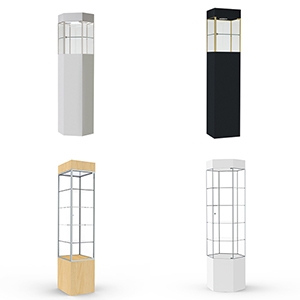 Dimensions: 75" x 16" x 16"
Dimensions: 80" x 20" x 20"
Dimensions: 75" x 20" x 20"
Slimline Towers come in stationary hexagonal and square designs. Each has four sturdy acrylic shelves that are infinitely adjustable. If ordered with lights the light column uses a 64" T6 fluorescent tube and operates on 115v AC.This product will be shipped VIA common carrier. Freight will be quoted separately. You will be notified of the freight amount.